A circular walk from Milovaig to Oisgill Bay, via An Ceannaich, returning from Waterstein. (7 miles, 4-5 hours). Follow the road around past the pier (photograph at the bottom of the page) and up-hill until you reach a dirt road on the right leading to a group of croft houses. From here head across the field at 90 degrees to the road, towards the cliff top corner of the fenced field ahead. The track here is quite boggy for a few hundred yards. Keeping between the fence and the cliff top, follow the sheep track around the headland. After about a mile you will see a magnificent natural arch at the base of the cliff. This is an excellent place to see seals fishing in the sea and the swarms of giant jellyfish that swim to the surface in Summer. Keep following the cliff-top track as it begins to ascend up to Biod Ban, past a small lochan. Waterstein and Neist from Biod Ban. At the top the cliff-top undulates and you will see three or four distinct peaks ahead, along Biod Ban. The path takes the lazy route along the level ground but you must climb to the top of the first peak you come to. This gives the most incredible views across the Minch, the whole string of Western Isles and down across Neist to Lorgill. 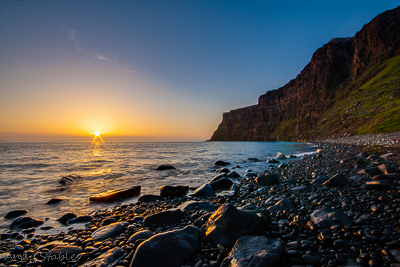 The cliffs here are over 650 feet high with a sheer drop to the sea below. The photograph, above, doesn't do it justice. Follow the cliff-top ridge along, up and down over the peaks, until the cliffs begin to descend down to Oisgill Bay (pronounced 'Oyz-Gill') (Map ). Here you meet up with a stone dyke leading up onto the second half of the ridge. There are three ways you can go from here: Either: a) follow the stream downhill to Oisgill Bay and join up with the coastguard hut walk, b) follow the ridge along Druim nan-Sgarbh until you meet up with the road, or c) follow the dyke directly back across the moor to Milovaig. 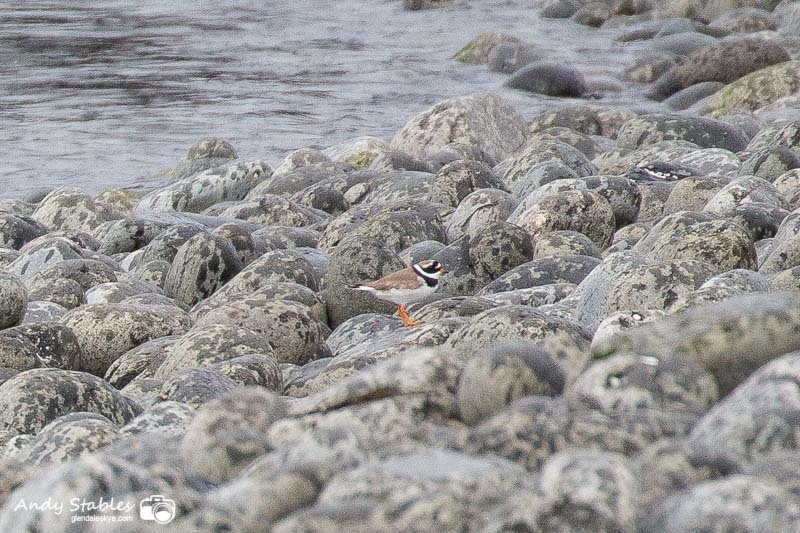 There were 12 ringed plovers on the white beach at Lower Milovaig at 7pm. 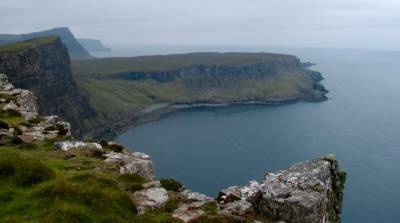 A four-hour seawatch at Neist Point produced 98 golden plovers flying south, 140 pink footed geese north, 683 puffins north and 125 manx shearwaters with small numbers of passerines flying south including skylark, meadow pipits, hirundines and goldfinches (per skye-birds.com). 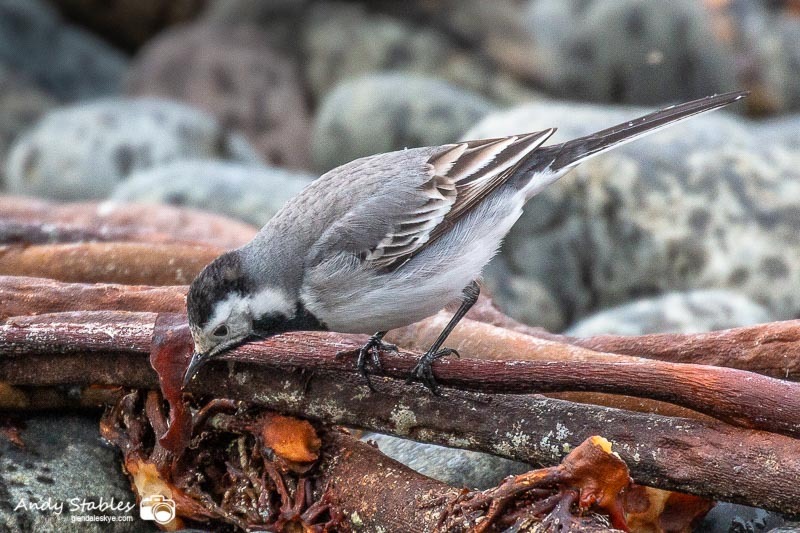 Early evening: A pair of red-breasted mergansers off the white beach, a greenshank on the white beach, three great northern divers off Meanish, a common sandpiper at Meanish, 7 ringed plovers at Meanish, two white wagtails at Meanish and a redshank at the seaward end of the Milovaig loop.